Schonbrunn pianos are built in Yichang City, China in one of the biggest piano factories in the world. These instruments are made to precise European traditions and have much of the warmth and characteristics of typically hand-crafted pianos but at a fraction of the cost. 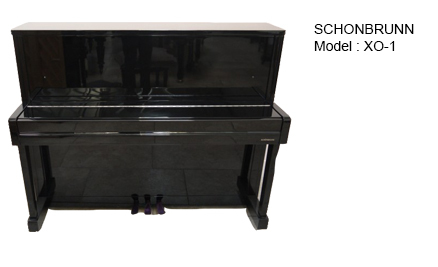 As such, the Schonbrunn pianos are one of our most popular range and we have sold many of these fine instruments to professional players, discerning amateurs and various London institutions. Though built in the Far East, this piano feels and sounds German but at a fraction of the price. It has a deep rich tone and has been the preferred choice for many discerning players on a budget. Like the XO-1 model but with added string length for an even richer sound in the bass. This model also has more curved lines in the cabinet.